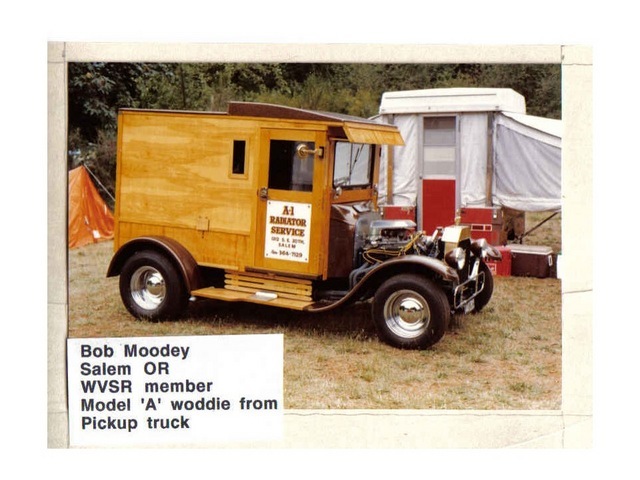 The Willamette Valley Street Rods has been in continuous existence since first established in 1970. 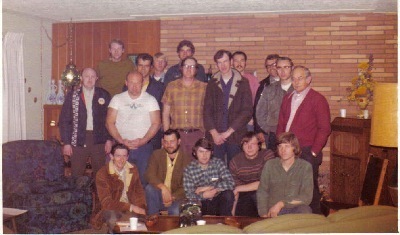 To the left is an photo taken at an early club meeting held at Jerry Keppinger's home April 8, 1974. First Row: Bud Graham, Dan Pullen, Dave Lecompte, Warren Sheppard, Cliff Joerg Second Row: Howard Dutoit, Jerry Keppinger, Gary Farrier, Tony Mills, Bill Sanders, Bob Pendergraft. Back Row: Mel Meyers, John Stanton, Boyd Jensen, Doug Daggett, Dale Wheeler, and Gary Juran. In the early days it was the Willamette Valley Street Rod Association (WVSRA) and we hosted a two day "rod run" at Silver Creek Falls Park where most camped overnight and enjoyed events like club hosted dinner and dancing, games, and poker runs while sharing stories about their cars, other rod runs, and new customizing ideas. Through the years the club dropped "Associaton" and added "Kustoms". We've since returned to our roots with our name. One of the events enjoyed at the club event was "blind driving"! The object was to direct your blind driver through a coned course in the fastest time possible. During competition you always found out which guy should stop and ask for directions. 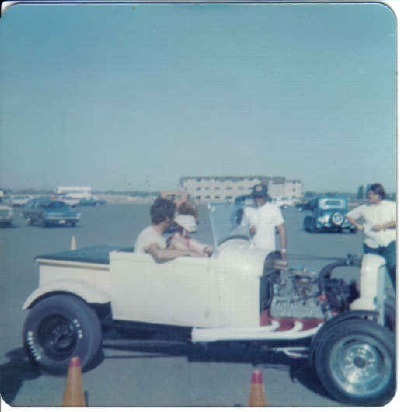 In this 1974 photo John Stanton is ready to give his blind driver Connie what seems like simple directions in their 27 Ford Roadster PU. Stop... Go .. Left ... Right.. what could be less complicated right? PHOTO GALLERY FROM THE PAST. This is from the early days of the club. Taken off a newsletter from 1977 the logo and name has evolved along with technology and graphic artistry.